High Noon Classic Slot Guide & Review - Casino Answers! 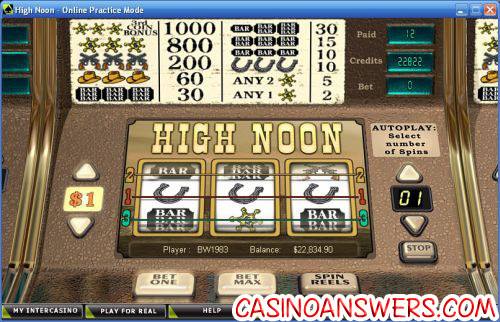 High Noon is a 3-reel, 3-line classic slot machine developed by Cryptologic. You can play the High Noon classic slot game at Casino Joy and VIP Casino. Bets available on the High Noon classic slot machine are $0.01, $0.05, $0.10, $0.25, $1, $2 and $5. Once you have selected your coin value, you can choose to bet 1-3 coins by using the “Bet One” and “Bet Max” buttons. For each coin you play, another payline will be activated. To play the High Noon slot machine, use the “Spin Reels” button. The highest paying symbol on the High Noon slot is the Sheriff’s Badge symbol. On 3 coin bets, the Sheriff’s Badge will pay out 1000 coins. On all other bets, the Badge symbol will pay out 800 coins. Try and win the top jackpot on the High Noon slot game, saddle up and start playing now Casino Joy! There are 10 winning combinations on the High Noon slot machine. The full payout schedule is as follows: 1 Badge symbol (2), 2 Badge symbols (5), 3 Horseshoe symbols (100), 3 Single Bar symbols (10), 3 Double Bar symbols (15), Single/Double/Triple Bar (30), 3 Triple Bar symbols (30), 3 Cowboy Hat symbols (60), 3 Pistol symbols (200), 3 Badge symbols (800), 3 Badge symbols on maximum bet (1000). There is a basic autoplay mode available on the High Noon classic slot machine. You can select up to 99 spins to the right of the reels, followed by the “Bet Max” or “Spin Reels” button to start. To stop the autoplay mode on High Noon, hit the “Stop” button. High Noon is a lackluster classic slot with nothing that makes it stand out. Many Cryptologic classic slots have much higher payouts and you can find many classic slots with at least a wild symbol. To play the High Noon slot machine, please visit Casino Joy. Are players from the United States able to play the High Noon slot for real money? At this time, American players are not able to play at Cryptologic casinos for real money. For a western-themed video slot US players can play, check out Western Wilderness at Superior Casino. Where can I play more western slot machines? If you want more of the wild west, you can play the Silver Bullet and Wanted Dead or Alive video slots at Casino Bellini or read our Casino Bellini Review. Where can I play the high noon casino game? What casinos allow me to play the high noon classic slot for free?